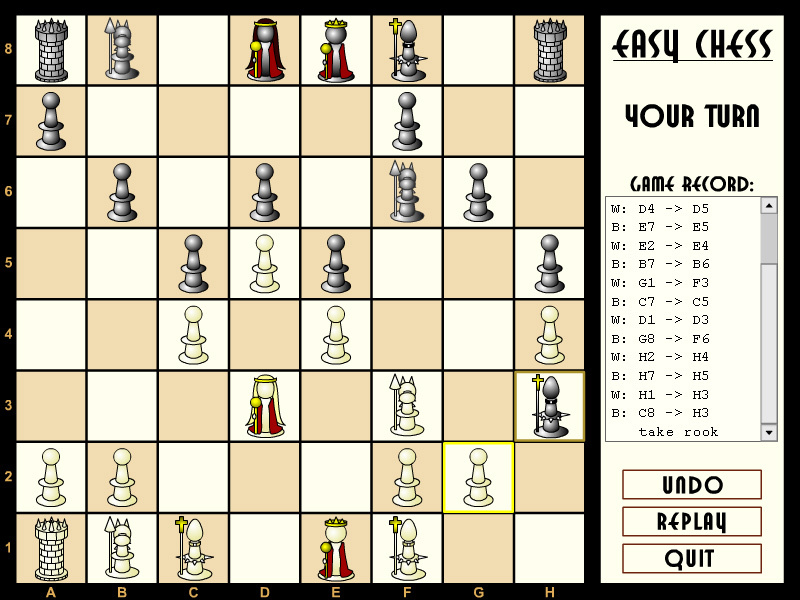 "Chess" is a free online logic game with 32 black and white figures. 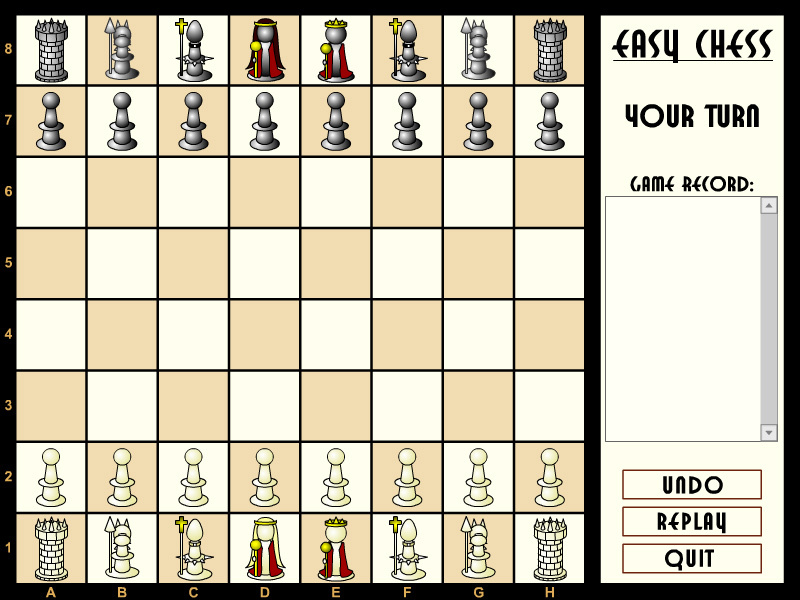 Play Chess online against computer. Board game. Fun logic learning game. Take all the oponents' figures to win. To learn chess rules play the Chess Pieces Puzzle. 1 King - moves one square all directions. 1 Queen - moves all square all directions. 2 Rooks - moves all square vertical and horizontal directions. 2 Bishops - moves all square diagonal directions. 2 Knights - moves to a square that is two squares away horizontally and one square vertically, or two squares vertically and one square horizontally, jumping over figures. 8 Pawns - moves one square forward (from original position 2 squares). This is a classic chess game made by James M. Burton. Detailed rules are described in the Class subjects section. Know how to win a Chess game. Chess is a two-player strategy board game played on a chessboard, a checkered gameboard with 64 squares arranged in an 8x8 grid. The game is played by millions of people worldwide. Chess is believed to be derived from the Indian game chaturanga some time before the 7th century. Chaturanga is also the likely ancestor of the Eastern strategy games xiangqi, janggi, and shogi. Chess reached Europe by the 9th century, due to the Umayyad conquest of Hispania. The pieces assumed their current powers in Spain in the late 15th century; the modern rules were standardized in the 19th century. Chess is played on a square board of eight rows (called ranks, denoted 1 to 8) and eight columns (called files, denoted a to h). The 64 squares alternate in color and are referred to as light and dark squares. The chessboard is placed with a light square at the right-hand end of the rank nearest to each player. By convention, the game pieces are divided into white and black sets, and the players are referred to as White and Black, respectively. Each player begins the game with 16 pieces of the specified color, consisting of one king, one queen, two rooks, two bishops, two knights, and eight pawns. The pieces are set out as shown in the diagram and photo, with each queen on a square of its own color (the white queen on a light square; the black queen on a dark square). In competitive games, the colors are allocated by the organizers; in informal games, the colors are usually decided randomly, for example by concealing a white and black pawn in either hand and having the opponent choose, or by coin toss. The player with the white pieces moves first. After the first move, players alternate turns, moving one piece per turn (except for castling, when two pieces are moved). Pieces are moved to either an unoccupied square or one occupied by an opponent's piece, which is captured and removed from play. With the sole exception of en passant, all pieces capture by moving to the square that the opponent's piece occupies. A player may not make any move that would put or leave the player's own king under attack. A player cannot "pass" a turn; one must make a legal move (this is the basis for the finesse called zugzwang). If the player to move has no legal move, the game is over; the result is either checkmate (a loss for the player with no legal move) if the king is in check, or stalemate (a draw) if the king is not. Labels: Board Games , Classic Games , Learning Games , Logic Games , Education Games , Free Online Games.